Holidays and trips abroad are special times in a child's life and they enjoy drawing and writing about exciting new experiences while they are still fresh in their minds. 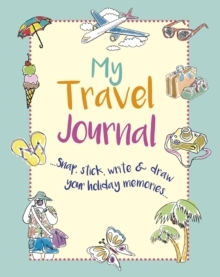 They also love collecting tickets, postcards and other mementos from the places they visit and this versatile journal is just the place to keep everything together, safe and organised. With album-style pages for photographs taken along the way and activities designed to develop observational skills and help kids appreciate the world around them,My Travel Journal creates a charming narrative about a special time or place.Encouraging kids to embrace new sights, sounds, smells and tastes at the same time as treasuring their memories and keeping them safe, My Travel Journal will become a much-loved keepsake of a special holiday.